How to get channel sales or indirect sales going for your startup? When I talk to entrepreneurs who are developers and they don’t have a hustler (sales person) on board, they ask me if they should outsource their sales function. I usually advice them never to outsource startup sales efforts. They then look to find partners who they can work with. The main reason they want to do this is because they find the entire process of hiring, managing and growing their sales team revolting. Some of them talk about possible “channel” sales efforts via partners or larger companies in their domain who can help, who they would like to approach. When I tell them about the potential costs, commissions and the customer relationship efforts that are involved, they take a second look at their direct sales efforts. I thought I’d document that for many of the other entrepreneurs who have the same question. There are 5 models of partnerships I have encountered so far in my career. I will outline these models and list their pros and cons. While I cant say which model will work for you, and there may be other models as well, I think understanding the landscape will help you figure out which one makes sense in your situation. 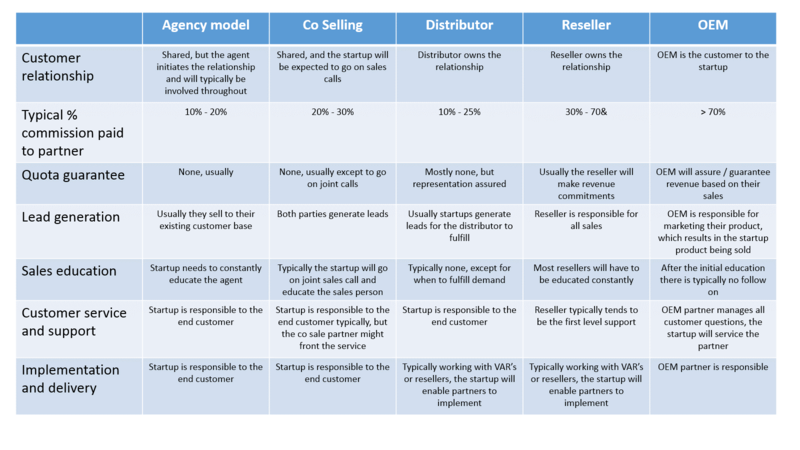 First off, most channel or indirect sales models assume that the partner has an existing relationship with the startup’s customer. After all you are trying to shorten your sales cycle by using the partner’s strength. Lets now look at these different models. 1. Co selling partnerships: These agreements tend to have a low to medium level of commitment from both the partner and the startup. If a sales person from the partner is going to meet the client, and are in active discussions on a deal and they feel like bringing your solution will help them win the opportunity, they will look at trying to position your product as well. In this case, you will have to go on the sales call with the sales person at the partner. The advantage of this partnership is that you typically dont have to do the initial “opening of the doors”. The “paper” or contract is typically separate as well. This means there will be 2 separate agreements for the customer to sign. Pros: Since there is no commitment (most times) from both parties towards a quota or target, the discount you offer to the partner is low (typically starts at 20% and can go up to 30%). Also, since you can have a direct relationship with the customer, you can control the relationship going forward. Be sure to ensure that there are lower levels of “pass through” revenue you have to pay to the partner after year one. Cons: There is no commitment to sell by the partner so you cant quite depend on this channel to deliver consistently. The customer also tends to get confused about the single person who will responsible for their success (the bad term usually used is one throat to choke). 2. Reseller agreements (sometimes called VAR or Value Added Resellers) : This partnership is medium to higher level of commitment. The partner will either resell your product on their paper or include your “quote” in their contract. You will hence have to train and manage their sales professionals. Pros: There is a quota commitment in most cases, so you can be sure that sales people are motivated to sell, but you want to be sure that there are some downsides if they dont hit the commitments, else all this is a co selling agreement structured on the partner’s paper. Cons: Since there are commitments, you will pay a much higher commission % – typically 40 – 60% are standard. Some partners may ask you for more. You will still have to train and do the lead generation to bring their sales folks into deals. Typically when you sign an agreement, even if you bring the partner into a new customer, they might ask you for the commission that they technically dont deserve. 3. OEM associations: When your product (or module) becomes part of another product and is integrated in such a way as to cause sales of your product each time the other product is sold, have an OEM (Original Equipment Manufacturer) association. These are typically for run time modules of developer products or a contact management product within a CRM system as an example. Pros: Since your product is part of another product, you will typically be sold each time the other product is sold. In most cases this guarantees revenues and commits the partner to certain revenue goals. Cons: Since your product is part of a module, you dont have the end customer relationship. Most OEM products also tend to generate smaller % of sales. Don’t be surprised if the final product is sold by the partner for a significantly more cost that what they pay you. Typically I have seen 10% of the final cost of the product paid out to the module. There are 2 other models that I dont have much experience with, so I will let you give you an overview and try and address them in a future post. 4. Certified agent alliances: These are loose agency models (typical in affiliate sales) where the solo sales person who maybe has a few clients will try and sell for you. Since you have to recruit and manage each sales person yourself, these will be hard to scale. The only advantage is that the sales person is not an employees, so their base salary costs dont hit your books. This also means they are less committed to your product. 5. Distributor agreements: When your product is sold in a different geography where you need a local partner to stock (for hardware) or help educate local re-sellers, then distributors can help you with education, local tax and integration and identifying resellers. They can help you navigate a local market, but since they stock and manage multiple products for that region, getting their attention to focus on your product tends to be rather hard. If you liked this post, please follow me on Twitter and say hi. I will follow folks who comment or tweet back usually. Previous PostHow to move from “selling through my network” to “building a sales process”? #entrepreneurSalesNext PostCold calling does not work during, customer development process, so what does work?